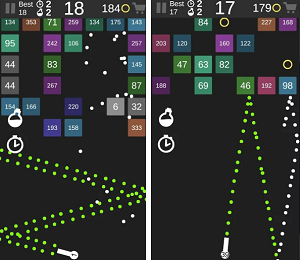 The most addictive Android games are the ones you can pick up and play in seconds. They need to be fun and easy to play, yet hard to master. Or those that take hours and hours (or years) to complete. All of which is extremely fun but can also be frustrating and addictive! We have exactly that for you below, a game called Follow The Path. We liked it so much, so we’re pronouncing it as an Arcade Game of the Month. What is Follow The Path? Follow The Path is an extremely addictive arcade game, suitable for users of any age. If you’re a fan of endless gameplays and randomly generated challenges, then this game is the right choice for you. You can play it on your Android phone and tablet, even if you’re without Internet connection (it supports an offline mode). We can freely say that Follow The Path provides with hours of fun. The main goal in this game is to take control of the ball, do zigzags and avoid hitting obstacles or walls. This will require your best speed and reflex skills. Do as many zigzags as you can in order to survive and collect gems, but try not to fall or hit the obstacles. The further you go, the higher your scores will be. In addition, the platform will be generated randomly in the beginning and that’s why it is more challenging than other arcade games. Are you up for the challenge? Even if you lose, you can tap the replay button and start all over again. We especially liked the games design – the whole style is different, the graphics are HD and the sounds as catchy as they can get. If you want to enjoy one the best speed games ever, visit the Google Play Store’s link below and get it immediately – it’s totally free to play! With the Bitcoin price setting new records on a nearly weekly basis, it has become more important than ever before to keep track of one's crypto currency portfolio. There are many new apps that offer to make this experience easier for you, helping you to manage your investments without much effort. How to choose the right app? No worries, we did our research and we have for you a finance app for crypto currency management and tracking. Let’s discuss it. What is so special about this finance app? Developed for android and IOS users, simple for using and highly efficient this finance tool is a crypto currency management app, offering users all in one experience with their crypto currency investments. On the app users are able to enter and track the holdings, adding them in multiple portfolios and managing them as they want to. The app is keeping users also informed about changes in the crypto currency world and giving them fresh information about what is happening on the global market. Coin Nexus as the finance app for crypto currency tracking and managements is giving users helpful and practical features in order to manage and view their investments and holdings on the best way possible. 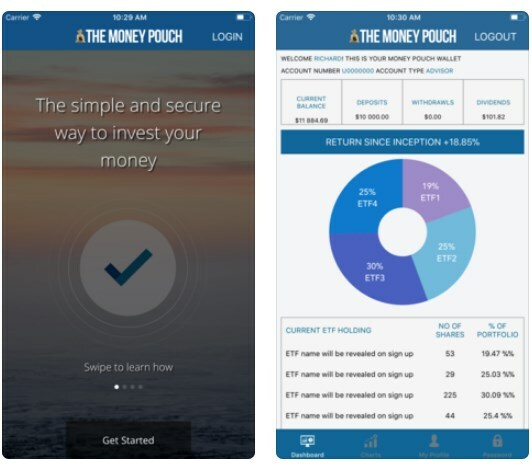 By using this app, users are offered to simply enter their crypto investments and track them with setting them in multiple portfolios that are supported by the app. To the portfolios, the users are able to add wallets and view or manage those wallets by their preference. Rewards such as mining and stalking or even transaction feeds can be added to the wallets too. 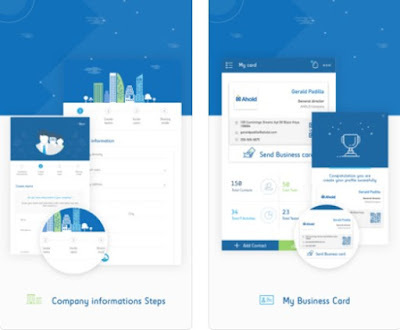 Users with this app are guaranteed safety and security because the app allows them to restore and backup all their data to any other device. The app supports more than 200 crypto currencies and over 200 exchanges to inform the user about the global market of crypto currencies and also offering him constant information and news about the changes happening in the crypto currency world for over 2000 crypto currencies. Download the app now on Google Play and App Store to manage and view all your investments! We recently discovered a great Android dating app that stands out from the others on the market, called Hoorce. Why is it so different than other dating apps? Because it is perfect for straights, gays, lesbians and transgenders, and a platform that helps users to find nearest friends looking for adult encounters and casual hook-ups, to flirt, chat discreetly and meet them secretly. Because of that, and many other reasons, we chose it to be our Social App of the Month. Let’s see why! Companies across employment sectors report that as many as 70% of their employees struggle to stay engaged in work – and plenty of that discontent comes down to poor employee-manager relationships. That means that inspiring trust at work should be no small priority – especially for managers and those who hold leadership positions. 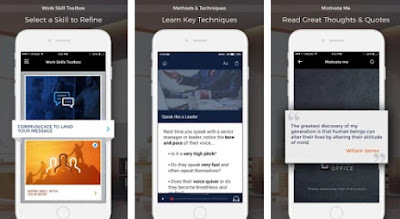 Whether you’re gunning for a big promotion or just want to brush up on your leadership and management skills, there are apps from executive coaches and best-selling authors that will take you where you need to go. Want to make some mini career-changing resolutions for this year? And how about if I make that incredibly easy by providing you with a powerful app suggestion that take a lot of the work out of it? Great – meet Corner Office! For everyone that likes to feel a thrill by playing intense action games while getting to feel like a real hero that destroys all evil, you can now easily play that kind of game on your phone. Many action games have been created that offer you the action you seek but finding the best one, can be very tricky. So, we did our research and we have an action shooting game full with epic battlefield missions to enjoy and complete to win a victory against evil. Let’s discuss it. Developed for android users, simple for playing and yet highly challenging game that will test the player’s skills of fighting, strategy and shooting while giving him a chance to become a hero and save his kind from the evil terrorists. This classic platform shooter is offering players to take the lead on to save their nation and testing their commando leadership skills by completing challenging missions and destroying all evil that threatens them. With the amazing and intense sound effects on each mission and high-quality unique graphic design, players will have fun and enjoy the exciting gameplay, creating the best strategy in order to win the epic battlefield mission. What are the best features of this game? 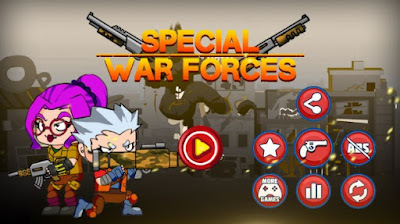 The Special War Forces has to offer amazing features to enjoy, keeping the attention of players and getting him to test his skills of battling and fighting. Players get to have fun completing variety of challenging missions in 12 different levels, testing their shooting skills and taking commando lead to save the nation from evil. Players can choose from variety of deadly weapons to help them destroy the enemies and complete the missions. Unique characters with special abilities are offered on which the player will take the lead on to fight and strike against evil. Simply, the player has to choose the character for fighting and use the screen controls for moving and jumping with that character. Also, with the screen controls for shooting and bombing, the player will easily destroy enemies and get to his next mission. Intense raid escape game with thrilling and exciting gameplay action will test the player’s skills and win the warfare survival victory to save the nation. Download the game for free on Google Play now and lead your nation to victory! If you're into casual puzzle games, chances are you've come across one or two match-3 games throughout your journey. Or maybe a few dozen. The fact is, the sheer number of match-3 titles available makes it hard to separate the good from the bad. But we're here to help. What follows is one of the best that the genre has to offer, a fresh and inventive game that simply takes a good thing and makes it better. If you're looking to waste a whole lot of time, this game will be more than happy to help. 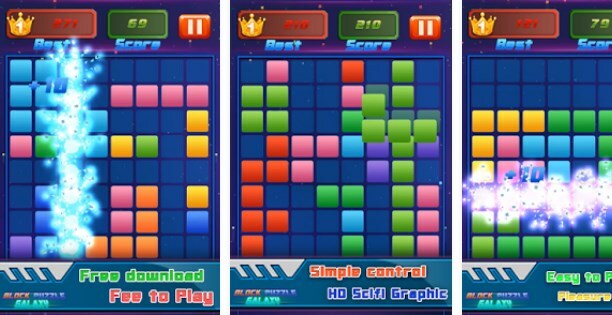 Block Puzzle Galaxy is unlike any other drop block puzzle game. Yes, the rules are clearly the same but don’t be fooled. This game is created carefully and precisely to give the player an awesome time and hours of endless fun to enjoy. All you need to do is drag the blocks coming from the bottom and create a vertical or a horizontal line. That way you get higher scores and you make space for the incoming blocks. If ou let the blocks pile up on the board, there will be no space left for more blocks to come and the game will end there. 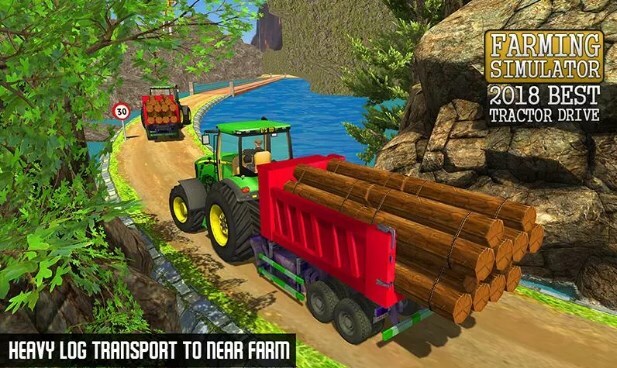 Designed with colorful HD graphics and animations, this game will definitely addict you to the fullest! 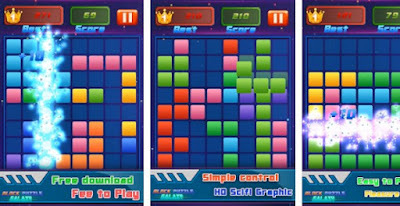 Block Puzzle Galaxy is a block puzzle designed with very pretty colorful blocks, amazing galaxy graphics and stunning animation. The game is very easy to play and enjoyable for players regarding their age. Easy to play, pleasurable for players of any age, this block game offers smooth controls and infinite classic puzzle gameplay. Just slide the blocks on the board and drop them – we guarantee endless fun! Compete and share the fun in this puzzle journey to your friends on social media, show your best strategic moves to get higher scores and even compete with players around the world. Download the game for free from Google Play. One of the most popular and interesting games that all game lovers will enjoy are certainly the puzzle games. Created many and many years ago but now on reach of our hands, offered for us on our smartphones. So, if you need a fun way to keep your brain sharp and test your logical thinking, developing your puzzling skills, you can easily do that with the right game. We did our research and we found the right puzzle for you to do this. Let’s discuss it. Looking for a fun way to distract your brain and relax your mind in your free time? What if you can do that with a game? One of the most interesting and popular game is the fidget spinning game. Now, you can play this game directly from your phone, anytime and anywhere. In order to find the best fidget spinner toy simulation game, you need to look through hundreds of game. To save you some time, we found the best simulation for fidget spinners. Let’s discuss it. 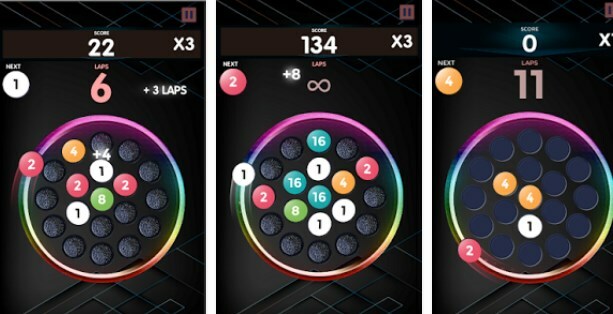 Developed for android users as an highly entertaining and addictive simulation of the fidget toy spinning game, on this game suitable for every age, players will have the chance to have endless fun spinning while relaxing and reliving from the daily stress. Simple for playing just by swiping on the screen players get to spin the coolest fidget toys while looking at realistic visuals with colorful designs. Endless fun and swiping are offered to players, getting the chance to choose their most favorite fidget toy and swipe to spin their stress and anxiety away each time they decide to play. This fidget simulation toy game has to offer quality and great features that will keep the attention of players and keep them entertained with each spin of the toy. 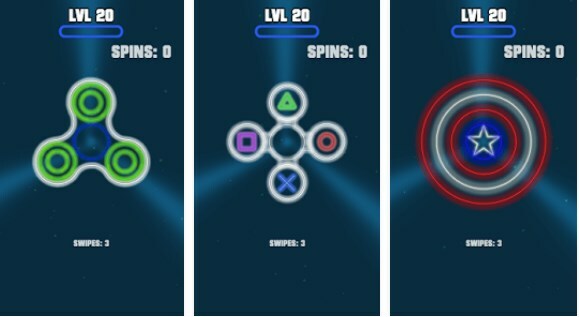 Directly from the phone, players get to spin their fidget spinner while relaxing and spinning their stress away. The game has to offer realistic visuals that give the feeling of a true fidget spinner game while enjoying the colorful design and amazing variety of colorful fidget spinners to choose from. Players are offered to choose their favorite fidget spinner and unlock all fidget toys available by the game to have endless fun every time they spin. The gameplay is addictive and simple just requiring one single swipe to spin the fidget. The player that swipes the hardest will get the most spins of the toy. This game, players can play just for their own amusement or to have fun with their friends. The variety of features and options offered and endless fun of spinning will entertain each fidget spin player while distracting his brain and help him relax. Download the game on Google Play for free and spin the stress away! Palmistry is the reading of the lines, shapes and sizes of the palm to reveal someone’s personality and character. All this time when I have been hearing about fortune tellers I have been saying that it’s a scam. However, fortune tellers have actually studied the art of palm reading. There are two sections of the art, they are Chiromancy, this concentrate on the lines of the palm and Chirognomy which focus on the shape and texture along with the colour of the palm. The two sections are what PalmistryHD implements to do just what fortune tellers would do. PalmistryHD is a palm reading app that is said to unveil your future, simply by taking a picture of the palm of your hand. You can get a detailed report of love life, happiness, career, health, success and much more. The app also contains a daily horoscope so you can keep an eye on your zodiac sign. PalmistryHD gives you an instant palm reading and uses a biometric algorithm to make sure it’s detailed and tailored to you. Once you download the app you will need to tap on palm reading. You will then be asked to enter your name, date of birth and gender. You can then choose to go for the free reading option, classic option or premium option. The classic option cost $8.99 and gives a bit more than what you will get in the free option. The premium option is the full package and gives you just about everything you would expect in your life. You won’t have to take the predictions within the app seriously because after all we write our own future. It’s a great entertainment app. PalmistryHD is free to download but offer in app purchase. The app is available on Google Play and AppStore. Online dating can be stressful, time-consuming, and downright awful. Thankfully, the best dating apps allow you to streamline the process. 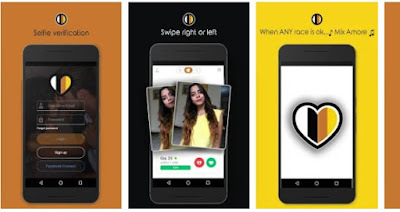 But, among so many apps offered for dating purpose, finding the right app that offers you to find your match for dating locally or internationally, especially if you look for multicultural relationship, can be quite tricky. Luckily for you, we did our research and we have for you one incredibly helpful matchmaker app. Let’s discuss it. Last week once Imbue was announced, we instantly reviewed it on Hightechholic, since it was a great idea. Now, after a week, we can easily say that it is one of the best apps we reviewed in the last 7 days. For that alone we decided to make it our iOS App of the Week. Read why bellow. The Imbue app takes the concept of a memory box and transfers it into the digital world. This app is designed and developed to serve its users as a digital memory box and kind of a time capsule. It’s a place where one can safely collect, preserve, organize and store all of their important digital memorabilia. Or it can be used to take pictures of items that mean a lot to them and save them within the app with appropriate video, audio or text notes along with the pictures. It's the easiest way to keep memories. You can use the Imbue app to safely preserve the stories and memories related to any item, be it books, recipes, paintings, letters, toys, souvenirs, artworks, photos and many more. It’s a platform where you can gather your special family memories and save them. You can also use the Pay Forward account option, which will save all your memories in the cloud for the next generation. This option saves your special memories for the next 25 years. And as we all know, the most exciting part about putting together a memory box is sharing it with others. With the Imbue app you can share all your memories with your family, friends and loved ones so you all can enjoy them together. You can find and download the Imbue app at the Apple App Store. Nowadays, each one of us at some point was or is playing games on their smartphone to simply fulfill his free time or to challenge and test his skills. One of the most popular games for killing boredom or testing skills are the games with endless gameplay that offer us to test our reaction time while keeping us addicted to playing and entertained. We did our research and we found one amazing endless space game for all of you. Let’s discuss it. What is so special about this endless space game? 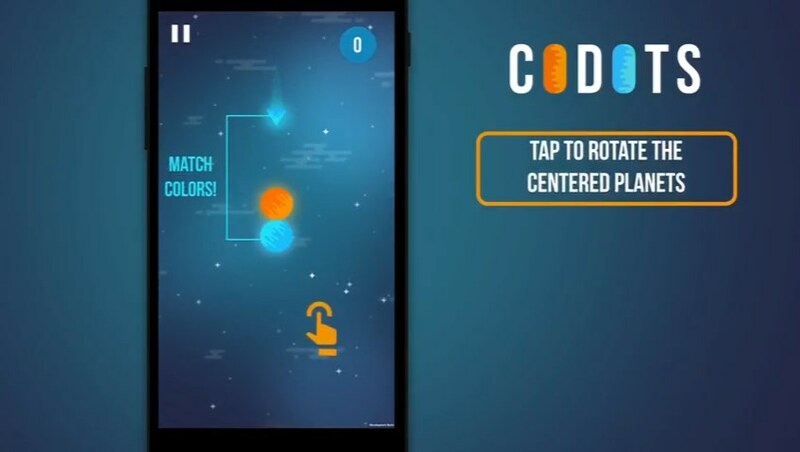 Developed for android users that are lovers of casual and endless space games, Codots will get them addicted to playing while letting them have fun while testing their reaction time, all in one gameplay. Fun and easy for playing, with a simple and yet highly challenging task, players will also enjoy the space design created with the amazing HD sharp graphics. As fast as the player reacts and as more as he progresses more and more scores he will get, getting the chance to achieve fastest skills or reacting and the chance to challenge friends and beat their results. Just rotate the dots to collect matching obstacles. When it comes to the features offered this incredibly fun and challenging game, players will have the chance to better their reaction time, become faster and push themselves to progress in the game win the best results. On the game players need to rotate the centered dots if they want to collect all matching obstacles that come towards the dots. 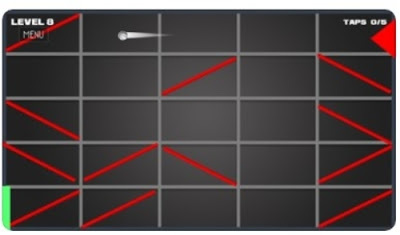 Simple but as the game is progresses, it becomes faster and the player needs to be faster in order to collect the obstacles and win the highest scores. For players that have problems keeping up they can use the game’s power-ups to slow the game down. Also players can challenge friends to play the game, compare scores and try to beat their scores for more fun. 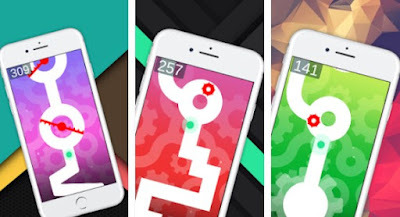 Players have the option to unlock 4 different game modes and every mode has different mechanics of dots and different directions and colors of obstacles. Constantly having fun with new challenges and different modes, this endless space game will keep players interested as it tests their reaction times. Download the game on Google Play now for free and have fun challenging your reaction time! Many games for smartphones offer us the chance to test our skills of fast reacting and tease our brain, pushing us to think harder and faster in order to win high scores competing with other players. One of the most exciting games for playing that will also test your skills are the arcade tap games. So, if you want to play, have fun and challenge your skills and brain in the same time, we did our research and found the best game for you to do that. Let’s discuss it. What is so special about this arcade? 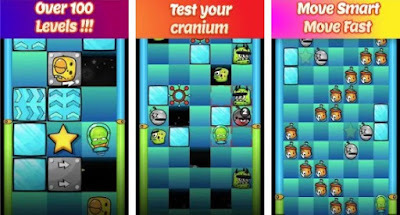 Developed for android users, highly fun for playing and with simple and addictive gameplay this tap arcade game will test the player’s skills of reacting fast and tease the brain to think faster and harder. By playing this tapper arcade player just have to tap to catch the red dots while keep on swirling. 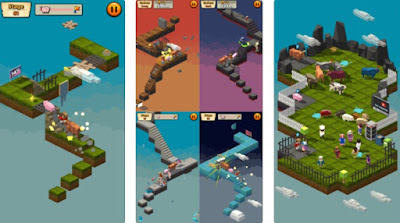 With impressive high-quality graphics and simple IU, the game offers excitement by getting high scores and many achievements for the best players. Players will have fun to tap and keep on swirling while competing with friends or people worldwide to win the title of best arcade tapper champion! What are the game’s best features? When it comes to the features offered by this fun and addictive tap arcade game, all players will enjoy and have tapping and increasing their scores simply by fulfilling one simple task. On this tapper arcade players just need to tap on the red dots to catch them while keep on swirling. By testing his reflexes and reacting fast, players will get to progress in more than 500 challenging levels, increasing their scores on the way. 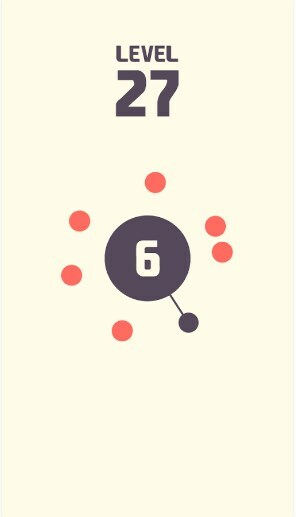 Each new level brings more and more dots for catching, making the game harder for playing. If the player is acting fast, catching all dots in each level he will progresses, get high scores and many stars and achievements for his amazing skills. Players can compare high-scores with friends to see who the better arcade tapper is, or even choose to challenge other players from the whole world and get the chance to become the ultimate tapper arcade champion, winning and having fun in the same time! Download this game on Google Play now for free and have fun swirling! As our Puzzle Game of the Month, today we’re presenting to you a new puzzle game that will increase your analytical thinking and relax you to the fullest. So if you want to have fun and enhance your brain activity, now is the time to download Digits Puzzles Matching Combo Star. See what the game is all about in our review below. Sometimes you have a question you need answered and you just can’t make a decision on your own. This is a good time to use a social polling tool where you can create customized questions and then let your family, friends, and even total stranger vote on the answers and share comments. It’s an easy way to get input on any of your decisions, large or small. We did our research and we have for you one amazing social polling app. Let’s discuss it. Developed for android users, simple and easy to use, this social polling app for asking questions and making polls, allows users to enjoy their time in the community for engaging and settling discussions with other users on any topic possible! With the help of the social app, users will be able to ask friends and get answers or help to decide something, engaging in discussions and settling arguments with others. By using the app anyone that needs to ask anything or needs help to make a decision this community is a great and fun way to do that while enjoying the rich conversations each time. Blendin as a social polling app has amazing features to offer for the community and each user that is a part of it. By using this app users will be able to ask random questions on any subjects or even create fun polls for other users engage in them. On this app, users will find layouts for customizing their polls by their own preference, creating amazing and visually gorgeous polls. Below each poll or question the user asks there is a comment section where other users can engage and be a part of the discussion, helping the user to get his answer and help he needs on any topic. Users in this community can settle arguments and engage in interesting and fun discussions, getting answers on any topic or helping others get answers or make a decision. Users can choose their Facebook account or Google account to login in within the community easily and effortlessly. 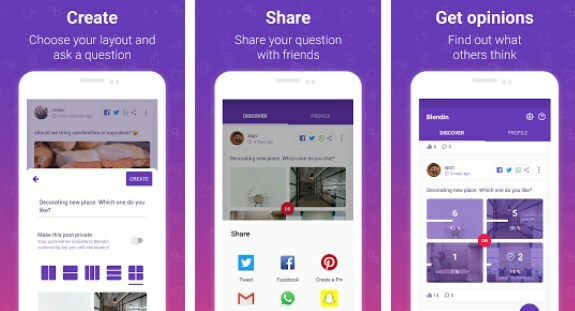 The app has an option for users to share questions with their friends. Get the answer you need fast while enjoying the time spent in this community. Download the app for free on Google Play and create polls on any topic! If your kids are like mine then they are always on their phones and they are generally either chatting to friends or doing something online. Whether that’s Facebook, Twitter, or some other website, they tend to not have any time for you. I find it hard to get my children’s attention, so much so I often take steps to confiscate their phones to get an hour of their time. It generally works out with them shouting and telling me they are going to move out. They are 12 and 15 years old. I often wonder if I could monitor what they are doing on their phones without having to take it away. I discovered Kidgy. Kidgy is the ultimate parental control app that allows you to monitor text, calls and websites that they are visiting. The app let you view apps that they have installed and block websites. You can even set task remotely, such as wash the dishes or remind them to do their homework. You can even set a virtual barrier which is call a geo-fence. This gives you a notification if they leave or enter that zone. The panic button within the app gives the child the option to immediately notify you if they are in any danger. You will then be able to see the device’s location and trace it. Kidgy is a really cool app and very useful to keep an eye on your kids. It’s the best way to organise your kid’s online activity remotely. Kidgy is subscription based and the price starts from $9.99 per month. You can option for either 1, 3 or 12 months subscriptions. The subscription automatically renews, so you can put your mind at ease that they will be protected if you forget. Download the app on AppStore and Google Play. You can find many helpful tutorials and tips about makeup and fitness nowadays on the Internet. However, when it comes to finding the best videos for your face and body features browsing the Internet can be hard and long. To save some time and find the best makeup and workout videos for your face and body shape can easily done with the right app on your phone. We did our research and we have the app that offers tips and tutorials for face makeup and body workouts for every one of you. Let’s discuss it. The ContourItt is developed for IOS users and all makeup and fitness lovers that look for the helpful tool for taking care of their skin and body and need advice and tips on how to contour and highlight to enhance, sculpt and define face features depending on their face shape. This unique app can be quite of help and use for people that need to learn the easiest way on getting the perfect makeup with watching simple live videos, tutorials and reading tips and hints. Not only that the app offers makeup help but it also helps with the health of the body and mind. 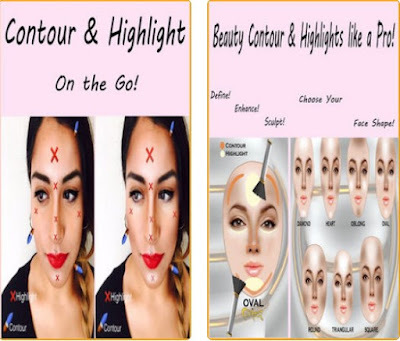 On this amazing beauty app users will get to enjoy quality features for every part of their body that will help them to easily learn on how to take care of their face, skin, body and mind without much effort. Simple and useful techniques, tutorials, live videos and tips are offered for users that want to learn how to contour their face depending on their face shape to enhance their face features and also learn how to take care of the skin health, keeping it in optimum health. With many tips and hints, watching tutorials and videos, users will easily learn about face mapping, guiding them step by step and even get amazing beauty tips from behind the scenes. For users that want to tone their body, this app is also offering fitness videos for full body workouts long about 20 minutes and suitable for every fitness level that help users to get fit and shape their body perfectly. With the app users can also learn how to take care of their mind too by learning mindfulness to keep relaxed, calm and more energized every day. Download the app on App Store now to learn all the beauty tips you need! Today, as our Social App of the Week we're sharing with you an amazing platform called Invite Me. This social networking tool is here to help you find your perfect fellow traveler, anywhere in the world. With simple user interface and tons of fun features for you to socialize, Invite Me is a revolution in this app category. 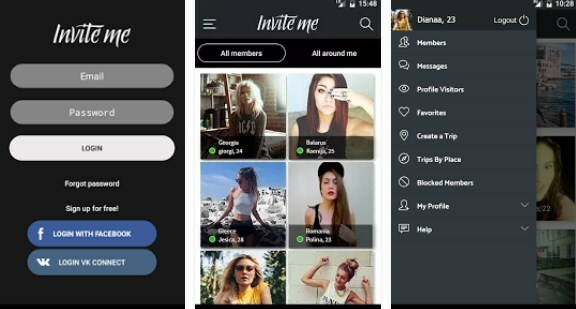 What is the Invite Me app? 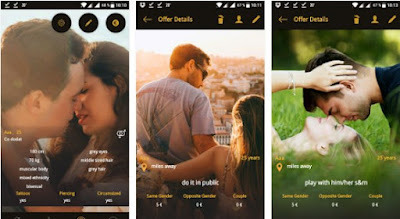 Invite Me is the find travel partner app that takes online dating on a whole new level. This app gives its users the opportunity to meet people from all around the world, especially the places they plan on visiting. For example, if you have planned a vacation at, let’s say, France the chances are you know not a single person there. With the help of the Invite Me app, you can meet people from the place you plan on visiting so when you go there you can get together, hang out with them, and who knows maybe you’ll meet your soulmate. All you need to do is set up a proper profile with information about yourself and the places you’ll be visiting and then start connecting with people from these places. You can chat with other users within the app, using the Invite Me private chat features. You can also get travel tips from other fellow travelers or share your travel experiences with them. All in all Invite Me is a great app providing users with the opportunity to make new friends, connect with people from all around the globe and explore dating possibilities. The app is available for both iOS and Android devices and it can be found and downloaded for free at the Google Play Store and the App Store. Playing card games like bridge can be quite fun and challenging in the same time. If you need to better your skills of playing bridge and learn everything to become master in this game then you need the right game to practice and even try yourself in bridge tournaments and compete. Finding a game that offers all these features in one is not easy and because of that we did our research and we found the right game that offers all you need for playing bridge. Let’s discuss about the game. What makes this app so special? 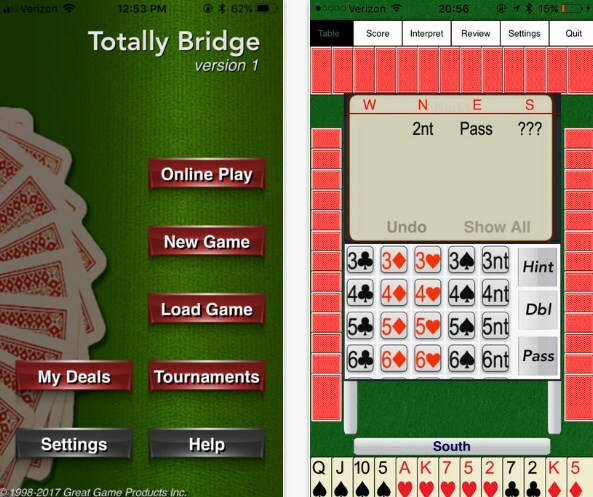 Developed for IOS users and with a 14 days free trial for playing and competing, only paying $1.49 when the trial finishes, this bridge game is offering having fun while improving bridge skills with bridge lessons and bridge tournaments with people worldwide. For everyone that enjoys to play bridge and loves card games, this game has high-quality features and functionalities that will test and better the bridge skills of the player, giving him a chance to try and win tournaments while having fun playing with friends and foes no matter where he is and when he wants. 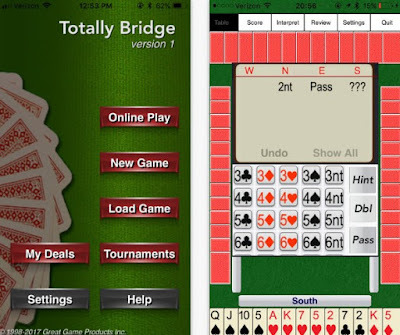 Totally Bridge as bridge card game has many features and functionalities offered that can be quite of help for beginner bridge players with amazing and simple lessons and for pros that like to compete and win against people from the whole world. Players on this game can choose to start a new game whenever they want, to save the game they started playing, to duplicate bridge or to even load the last saved game and continue playing. Hints are also offered to players, such as vocal bidding hints with explanations when the player is playing alone or with others and vocal play hints anytime the player needs them. Players can choose to play deals with all cards face up if they want. Players get to choose with what type of dealer they want to play, static or rotating and even choose who gets the best hand or the kind of deal they want to play, choosing from Slam, No Trump, Game, or Part Score Deal. Each bidding system that is offered by the game has various options such as Basic, Intermediate or Advanced for controlling the number of conventions they are being played. Players can compete in tournaments from ABF, ACLB or Cavendish with over 2 million of deals offered, having fun with friends or with people from around the world no matter where they are or when they want to play bridge. Download it now on App Store for free and compete with people from the whole world!